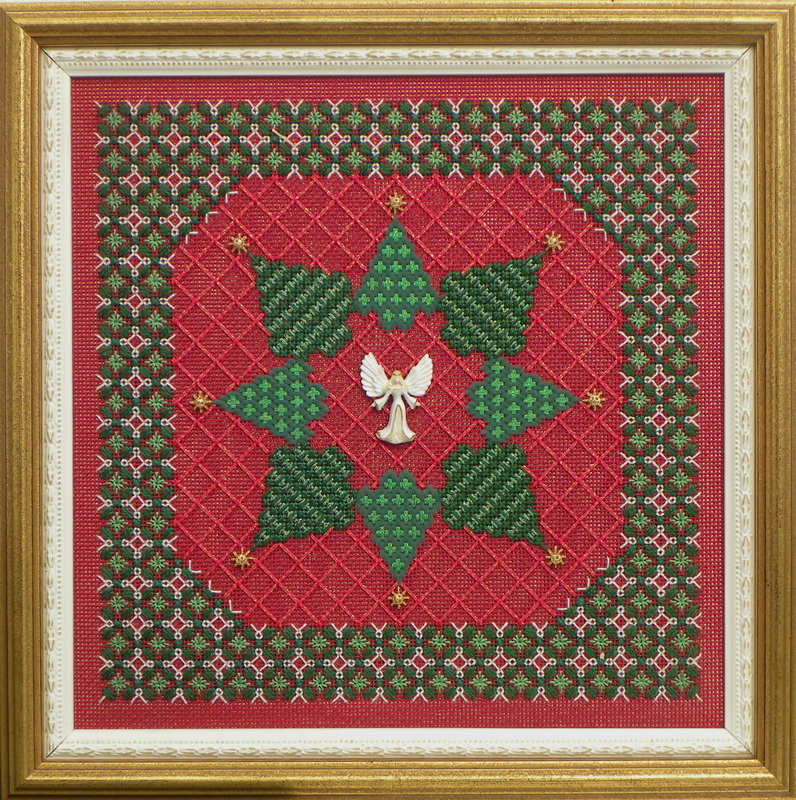 This elegant holiday design is totally charted and features one of Ann’s unique original borders with a main framework of four-way Diagonal Hungarian units with Smyrna Cross centers. The open areas are filled with eyelets and blackwork fillers. The blackwork outlines are not executed in the double running technique. The combination of alternating running stitches and back stitches used is efficient and conceals traveling threads just as well — also more comfortable for canvas enthusiasts who are used to wrapping their stitches. The ring of trees is a four-way arrangement of upright and diagonal trees. The composite patterns used form natural tree shapes and the “star” on the top of each tree is an eyelet with a decorative gold filigree ball in the center hole. The centerpiece of the design is a striking hand painted angel button. The background area is a two-way diamond trellis that is executed in Sparkle Rays. A unique “flying leap” sequence connects all of the laid rows in a clever continuous path that conceals all of the traveling threads.